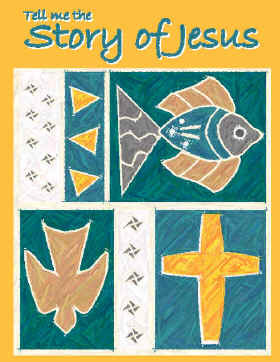 From Lesson Nine of, Tell Me The Story of Jesus. Read Matthew 16:17-18 from a child-friendly Bible. "Jesus, replied, 'Blessed are you "Petros" or "Small Stone," for this was not revealed to you by man, but by my heavenly Father. And I tell you that you are "Petros," "Small Stone," and on this "Petra" or "Boulder" I will build my church." Jesus did not say on this "Petros" or small stone I will build my church. He said, "On this rock or boulder, on this "Petra," I will build my church." Jesus was referring to Peter's boulder statement, and not to Peter. And what was Peter's boulder statement? He said, "You (Jesus) are the Christ, the Son of the Living God." His statement concerning Jesus, is the boulder, the "Petra," or the foundation of our Christian faith. The church must be built on Jesus and no one else. If we do not build our lives on Jesus and his teachings, if we trust in anyone or anything else, we will crumble and fall like a house that isn't built on a strong foundation. To remember this important message we will make "ROCK" Necklaces. What You Need: Flat, polished river rocks or colored landscape rocks (Approximately 1" in diameter, available in craft or garden stores. Polished rocks are more difficult to work with. ), 20 gauge copper or brass wire, scissors, needle nose pliers, hole punch, Peter's confession (in the patterns section of the book), 2-1/2' jute or strips of rawhide, hot glue. What You Do: Cut out pattern, from book, and punch hole. Beginning at the back of the stone, wrap wire tightly around rock so as to encase it (see above). Twist ends of wire shut with needle nose pliers. Turn ends of wire under. String jute through top of wire. Cut out Bible verse, punch hole and slide onto jute. Adjust necklace length to fit over child's head and tie shut. 4073. Petra; fem. of the same as 4074; (a mass of) rock (lit. or fig.):-rock. 4074. Petros; appar. a prim. word; a (piece of) rock (larger than 3037); as a name, Petrus, an apostle:- Peter, rock. 3037. lithos; appar. a prim. word; a stone (lit. or fig. ):- (mill-, stumbling-) stone.